Having lived just outside of Seoul for two years, I feel like I know that city fairly well (In fact, I even wrote a 1-day itinerary for Seoul already). However, my first instinct was to take the easy way out and simply find something already put together online. Unfortunately, my search turned up very little. It seems that most of the itineraries for Seoul are either badly put together or are too short. So, I figured that I would put together my own itinerary. What better place to start your visit to Seoul than in the heart of the city at Gwanghwamun Square. If there is one area that encapsulates what modern Korea stands for, it’s right here. If you look to the north, you’ll be enchanted by Bukhansan Mountain towering over the gates of Gyeongbokgung Palace. However, as you turn your gaze in the other directions, you’ll realize that are standing in the middle of a large, modern city. Giant TV screens attached to towering skyscrapers provide a great contrast to the history and natural beauty opposite, so take a moment to take it all in. Geunjeongjeon, the throne room of Gyeongbokgung Palace in downtown Seoul, South Korea. Once you’ve taken a few minutes to contemplate the complexity of modern Korea, head north, through Gwanghwamun Gate to Gyeongbokgung Palace. Gyeongbokgung was once the most popular of Seoul’s palaces and was the primary residence of the King. It was almost entirely destroyed in the early 20th century, but has been rebuilt recently and is a must-see attraction when visiting the city. Free English language tours leave from inside the palace’s entrance at 11:30a, 1:30p, and 3:30p and are definitely worth taking. After you finish your tour of Gyeongbokgung, head out the back entrance of the palace and catch a glimpse of the Blue House, home to Korea’s President, before heading back to the front of Gyeongbokgung along the outer walls. Back at Gwanghwamun Plaza, head northeast and follow the signs for the Bukchon Hanok Village. Tucked away in the heart of the city, you’ll have a chance to see one of the largest concentrations of traditional Korean houses in the city. Take some time getting lost amongst the traditional houses, tea shops, and art museums. Next, head over to Changgyeonggung Palace. While not as elaborate or impressive as Gyeongbokgung, Changgyeonggung is worth seeing for some of the interesting modern amenities that were incorporated into the palace (electricity, car parking, etc). The palace also has a very beautiful garden. After Changgyeonggung Palace, head back to the west, towards Gyeongbokgung, and check out Insadong. While some dismiss this area as being “too touristy”, it’s my favorite spot in the city. Not only is Insadong the best place to buy souvenirs in the city, but it also is full of traditional crafts, beautiful buildings, and great street food. Once you reach the end of Insadong, continue walking straight until you get to the Cheonggyecheon Stream. Recently uncovered after decades of running through underground pipes, the stream is now a popular walking area for tourists and locals alike. If you head to the left, you can walk all the way to the Han River, but if you head right, you’ll find yourself back in Gwanghwamun Plaza in no time. Visiting the North Korea is possible at the Korean DMZ. For your second day, wake up early and head out for a tour of the DMZ. Sitting just 27 miles from Seoul, the border with North Korea is the most guarded border in the entire world, and today you are going to head right into the thick of it. For a complete write-up of a visit to the DMZ, including how I legally crossed the border into North Korea, check out my full post: Visiting the Korean DMZ and Living to Tell About It. The key with any DMZ tour, is to make sure that you are visiting the Joint Security Area (JSA) and Panmunjom. While many companies advertise DMZ tours, very few actually give you the opportunity to cross the border and stare down North Korean soldiers. 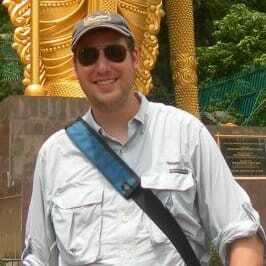 I would highly recommend going on the USO “JSA/DMZ and 3rd-Tunnel Tour”, the best out there. Reservations several months in advance are highly recommended. Once you get back to the city, head over to the nearby Korean War Memorial and Museum for a great look at Korea’s history. For your third day, we’re going to check out a bit more of Seoul’s history. You’ll start your day at Seoul’s City Hall Plaza. 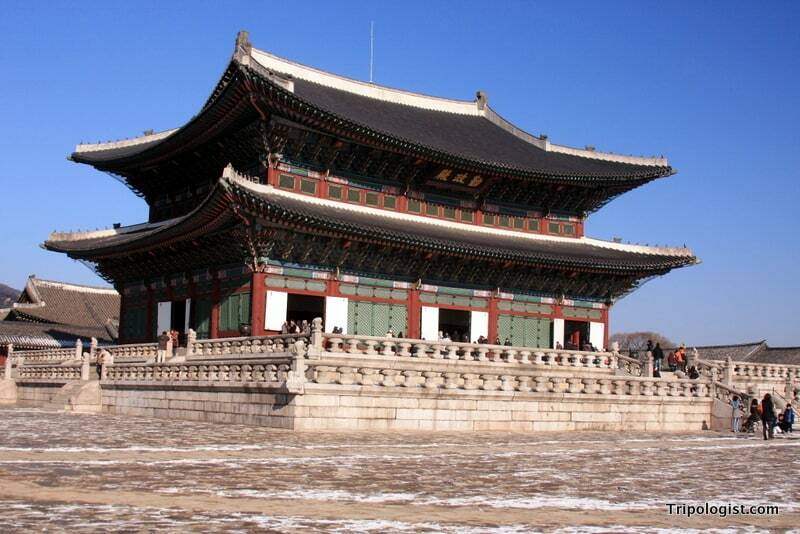 Your fist stop today is the nearby Deoksugung Palace. Despite being much smaller than the two palaces from Day 1, I actually like this palace a lot more than the other two because it isn’t as restored, giving the palace a more authentic and historical feeling. Wogudan, the Temple of Heaven, in downtown Seoul. In contrast to the Korean architecture of the palace are the on-site western style buildings. Inside the buildings, the Seoul Museum of Art is worth some time to explore the vast collection. You’ll also be inside two of the first western-style buildings built-in Korea. After you finish at Deoksugung, head to the opposite side of City Hall Plaza. Sitting in the courtyard behind the Westin Chosun Hotel is Wongudan Alter, also known as the Temple of Heaven. Built in 1899, the Temple resembles a smaller version of the more famous Temple of Heaven in Beijing, China. 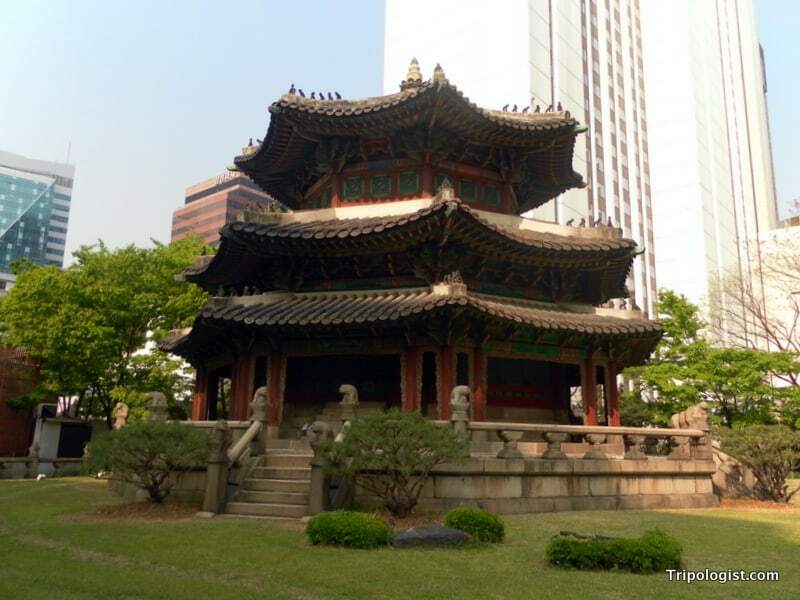 Wongudan is one of the least known of Seoul’s impressive royal buildings, though it was featured as a pitstop on season 17 of the American TV show “The Amazing Race”. Next, proceed down the hill, away from City Hall to Myeongdong. The center of shopping in Korea, Myeongdong has something for everyone. Tucked into the crowded, narrow streets are thousands of restaurants and shops, featuring both well-known brands and smaller mom and pop shops. If you make it to the area on a weekend or evening, you might have trouble finding room to breathe. This is the one area of Seoul where you can regularly find crowds that make New York’s Time Square feel like a peaceful park. After you’ve spent all your money in Myeongdong’s shops, it’s time to see the sunset. For this, you have two options. First, you can take a bus, taxi, cable car, or your own two feet to the top of Namsan Mountain for a bird’s-eye view of the city. To get even higher, take the elevator to the top of N Seoul Tower. The view from the top of the tower is the classic way to see Seoul from above. Honestly though, I don’t particularly care for the Tower, and prefer hiking to the top of one of the city’s many mountains for a more peaceful view of the skyline. For example, you could head to Yongmasan Mountain (at Yongmasan Station on subway line 7) for the short hike up to the top, which affords a fantastic view of the city at sunset. The view of Bukhansan National Park from Seoul’s City Wall. On the fourth day in Seoul, it’s time to do some hiking. Recently opened to the public, albeit with tight security, the hike along Seoul’s old City Wall is definitely worth the two to three hours that it takes to complete. While hiking, you’ll be able to get great views of downtown Seoul on one side and Bukhansan National Park on the other. Don’t forget your passport though, as it will be checked at the hike’s entrance due to its proximity to the President’s house. Once you finish the trail, take the subway to the National Museum of Korea (at Ichon Station on Subway Line 4). The museum’s permanent collection includes a great selection of Korean art and cultural objects from all throughout Korea’s history. For your last day in Seoul, start at one of the most peaceful temples in the city, Bongeunsa. Located in the heart of Gangnam (You didn’t think I would let you leave without getting down Gangnam Style, did you? ), the temple isn’t just a great example Korean Buddhist art and design, but also features a neck-wrenching Mireukdaebul statue, which stands 75 feet tall. For a sense of irony, head across the street from Bongeunsa to Coex Mall, the largest underground mall in Asia. Ridiculously large, and insanely easy to get lost in, this mall features hundreds of shops, a movie theater, an aquarium, and a kimchi museum, all located under the city streets above. If you can ever find your way out of Coex, it’s time to head out of the city for a half-day trip. The south gate of Namhansanseong in Seongnam, South Korea. My recommendation would be to head to Namhansanseong, an ancient mountain fortress that surrounds the top of Namhansan Mountain in the neighboring city of Seongnam. Built in the 15th century, this wall was the last place of refuge against the attacking Chinese in the mid-16th century. Visiting this mountain fortress will allow you to see some great Korean temples as well as the nicely restored village inside the walls. 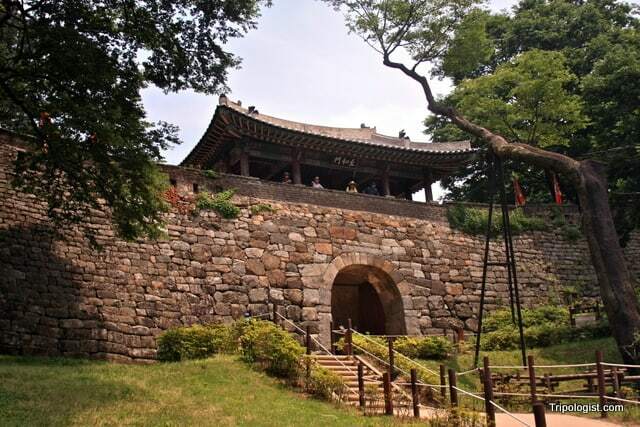 Should you be looking for something a bit more well-known, head to Hwaseong Fortress in Suwon. Recognized as a World Heritage Site by UNESCO, this fortress was built in the 18th century, and features a nice hike along the walls, which run through the city of Suwon. Should you be looking for some nightlife options at the end of the day, there are some great places to head in Seoul. If you want to spend time getting down like Koreans do, head to the clubs in either Hongdae or Gangnam. However, if you want a more international friendly area with mostly expats and US military members, head to Itaewon. On the other hand, if you are in Seoul during the Summer, check out a soccer game at the World Cup Stadium or a baseball game at Jamsil Stadium. If you follow this five-day itinerary for Seoul, you should be able to get a great feel for the history and culture of the Korean capital. Great itinerary! I still need to make it up to Seoul. Will my ARC be sufficient for walking the old city wall? Or should I bring my passport too? Unless they’ve changed the rules in the last year, you will need your passport, unfortunately. Worth the hassle for the great hike though. Hi. This is a great itinerary posted. A friend and I are planning on traveling to Seoul for 4 days, but right now the problem is accommodation.Is there a particular are you would recommend for hotels that would be convenient for traveling to and from the areas you have mentioned above? We want to spend more time seeing places and not stuck in buses! Thank you for your help. The best area to stay in really depends on your budget. The most logical place to stay would be in Jongno-gu, which is where many of the higher end hotels are. Cheaper accommodation is harder to find there though. If you are looking for somewhere inexpensive to stay, Hongdae tends to have cheaper hotels and some hostels and is relatively accessible to the whole city. Thanks for a great list of things to do in Seoul. I keep asking the locals for great ideas and they keep giving me great shopping areas. The list of things you have here is exactly the type of things that I want to do! Can’t wait to see everything! Glad the information was helpful, Jennifer. Enjoy your exploration! I am planning a 7 days trip to Seoul. This is the 5th time as most of the time I am in Seoul for work. Now finally for a short trip. As my mum is with me too, I do not want her to walk to far. We would like to see more of Korea.Can you please advise and help me to plan my itinerary?